Show Your Badge Offers | meetL.A. 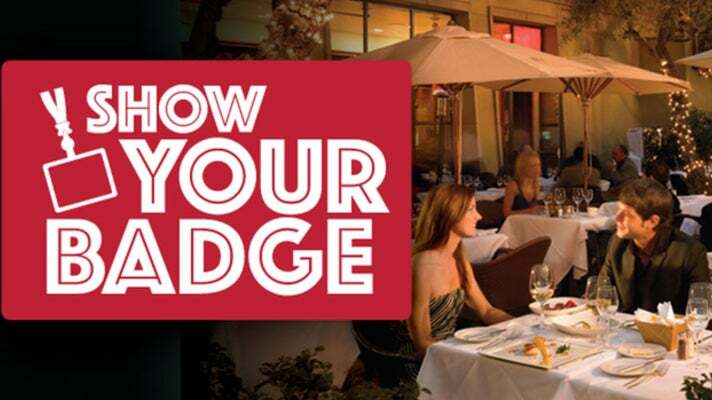 The Show Your Badge program provides convention attendess with discounts and special offers on restaurants, nightlife and activities throughout Los Angeles simply by showing their conference badge and mentioning this program. See below for a full list of offers and conditions. Save 15% when you book online using promo code SHOWYOURBADGE18 or contact us at info@adayinla.com and we'll take care of the booking for you! We also provide private tours and are experts in handling large groups! Offer valid for attendees or planners of a conference in Los Angeles. Verification of attendance may be required. Valid for tours taken in 2018. Subject to availability. Free General admission (Ages 0-5) includes the self-guided tour and interactive tour. Come and celebrate the American Spirit aboard Battleship IOWA-the only Battleship on the West Coast open to the public. Fun and adventure awaits with this special Show Your Badge tour ticket offer. The self guided tour takes between 60-90 minutes. The museum closes at 5:00 PM. Battleship IOWA will not allow entry after 4:00 PM. 20% on a premium golf club rental. Just enter the code ShowYourBadge20 at https://www.clublender.com/. Receive 10% off any supercar driving experience or ride-along at our Los Angeles racetrack located at the Auto Club Speedway in Fontana, CA. Spoil yourself and drive the supercar of your dreams on a real racetrack with expert coaching. Choose from brands like Ferrari, Lamborghini, Audi, Porsche and Nissan GTR. Use code LABADGE at checkout and show your badge on the day of your experience. Save 10% on every driving experience and ride alongs. It cannot be combined with any other EXR promotion and is not retroactive. Use promotion LABADGE at checkout and must bring badge on the date of driving experience. Offer valid until 02/01/2019. Book online, using the coupon code: BADGE during checkout for $10 off! A Handlebar Bike Tour is the best way to soak up some of that California sunshine, and immerse yourself for a few hours in the art, culture and history of DTLA. All tours are 2 hours, 6-8 miles, with plenty of narrated stops, for a comprehensive, informative and entertaining sight seeing experience. A perfect activity for a partner accompanying you to L.A. while you're at the convention! We are conveniently located at Grand Central Market, L.A.'s 100 year-old food hall, and walking distance from the Convention Center. Tour participants must be 15 or older. Online booking required. Show your badge at The Hollywood Improv and receive 15% off all food & beverage for an individual guest! For groups 10 or more please contact Lenise Strong at 562.685.3053 or lstrong@improv.com for even more great deals! With groups, you will receive priority entry, reserved seating, (1) appetizer and (1) drink ticket for just $25.00 per person + a complimentary souvenir glass. *Show tickets not included and vary depending on date. Come visit the best breweries in L.A. and take $15 off all public tours (4-5 hours) when you purchase online at labeerhop.com/schedule. Enter code SHOWYOURBADGE2019 at checkout. LA Beer Hop takes you straight to the source, visiting all of the best breweries in L.A., where you'll see, smell, and taste a wide variety of freshly made craft beer accompanied by an expert Beer Guide. Each guided tour visits three breweries and includes a flight of beer at each location, personal beer guide, and a behind-the-scenes guided walkthrough. We offer tours departing from Union Station, the South Bay, and Burbank & Glendale. Each tour lasts four to five hours. Public and private tours offered for any size group. Save 20% off the Hollywood & Celebrity Star Homes Tour, 2 hour tour. Discount Code: LACVB2018 All of your favorite celebrity star homes, showcasing the Hollywood Sign via Mulholland Drive • Beverly Hills • Rodeo Drive • Bel-Air • the Sunset Strip. Travel with entertaining expert guides with exciting narration and stories, through legendary neighborhoods and locations. View the homes of current celebrities and stars of the past. Get your camera ready, you just might see a STAR! Get 20% off any of our bicycle tours by using promo code LA81K3LUV at checkout. We have a 3 percent fee for refunds. During your visit take advantage of our exclusive offer for conference attendees and enjoy 15% off on any of our tours. Book online and use code BADGE18 or call us anytime. Come explore Los Angeles with one of our knowledgeable local guides and be immersed in the history, the culture, and excitement of LA! Visit us at www.latour1.com to make your reservation. Must show proof of conference registration. Cannot be combined with any other offers. Not valid on previously purchased tickets. No cash value. Not for resale. Management reserves all rights. Save 10% On An All-Inclusive Go Los Angeles Card! Visit multiple Los Angeles attractions for one low price. Visit top museums, tours, and activities, and pay nothing at the gate. Offer Valid through January 30, 2019. Not Valid on BYO Products. Show your convention badge at the Dodger Stadium Advance Ticket window to receive $5 off your next tour of historic Dodger Stadium. Restrictions: Limit one (1) offer per ticket purchase. Valid for child or adult tickets. Valid for Stadium Tours Monday through Friday. Present your badge from the Los Angeles Convention Center at time of purchase and receive $5 off Adult daytime general admission. Discount is not valid on previously purchased tickets, online, combo tickets and special ticketed events and cannot be combined with any other offer. Badge may not be reproduced or sold. Valid for up to 6 guests through March 31, 2019. Save up to 50% on Adult/Child general admission when you purchase online! Visit madametussaud.com/Hollywood and enter promo code 5036. Located next to the world-famous TCL Chinese Theatre, Madame Tussauds Hollywood is the place where you can take center stage with your favorite stars! Get up close to over 125 incredibly life-like figures from the celebrity worlds of film and television without velvet ropes or barriers. Plus, save the day during an action-packed adventure in the Marvel Superheroes 4D Theater. Experience the magic at Madame Tussauds Hollywood! Book online at www.oue-skyspace.com and use code: SKYLA17HJ to receive up to 22% off the retail rate*. Receive 15% off regular tram admission when you show your convention badge at the Tramway ticket counter. The Palm Springs Aerial Tramway—the world’s largest rotating tram car—travels over two-and-one-half miles along the breathtaking cliffs of Chino Canyon, transporting riders to the pristine wilderness of the Mt. San Jacinto State Park. During your approximately ten-minute journey, tram cars rotate slowly, offering picturesque and spectacular vistas of the valley floor below. Once you reach the Mountain Station—elevation 8,516 feet—enjoy two restaurants, observation decks, natural history museum, two documentary theaters, gift shop and over 50 miles of hiking trails. Offer is based on regular tram admission and may not be combined with any other discounts or packages. Show your badge for a 10% discount on nail, body and massage treatments at The Ritz-Carlton Spa; a 20% gratuity will be applied to all treatments based upon the retail treatment price. Savings of over 30%! One-day admission to Six Flags Magic Mountain. Valid now through December 31, 2018. See Park hours tab for operating schedule. Kids under 3 Free. Valid regular operating days. May not be used during private events. Get your special rate with STARCC code on www.starlinetours.com. Receive 10% off by calling us anytime at 818-687-2668 and mention the Show Your Badge program or use promo code MEETLA when reserving online. Sunnyday Scoot is a fully immersive, one of a kind adventure offering a variety of top sightseeing tours and rides in Los Angeles. You and your guest sit side by side, take turns driving, and enjoy the sights and scenes of this great city in these fun mini-convertibles that we call Scoots. Sunnyday Scoot was recently awarded "Best Local Tours in Los Angeles" for the 2nd year in a row and is top rated on travel sights so you are sure to have a great time scooting with us! We are open daily, year round, starting each day with our famous Sunrise Tour, a great way to start any day! Must show proof of conference registration. Cannot be combined with any other offers. Not valid on previously purchased tickets. No cash value. Not for resale. To view all policies, visit website. Receive 10% off horseback rides under the Hollywood Sign. Join us for a horseback ride under the Hollywood Sign and take in the beautiful city views. Check our website for information on all our rides. For availability information contact us. Walk-ups are on a first-come first-served basis. Call for availability. $5 Discount on General Adult Autry Museum Admission! Cannot be combined with other offers or promotions. Not valid during separately ticketed events. Show your badge at the Ford Theatres Box Office to receive 10% off tickets to a show of your choice. Please call the Box Office ahead of time to make sure there are tickets available for the show you wish to see: (323) 461-3673. Show your conference badge when entering to receive $2 off admission to the museum up to 4 guests. Kidspace exhibits and programs are designed for children between the ages of 1 to 10. Save 20% on Museum store purchases, including books, posters, and jewelry hand-made by a Holocaust survivor. Museum admission is free. To redeem offer, email jill@lamoth.org or call 323-456-5084 at least 48 hours in advance and mention "Show Your Badge 2018." Show your Badge at the Getty Center and receive a $5 discount on parking, and 10% discount in the Getty Store. The parking discount can only be applied at the Parking Office. Store discount does not apply to sale or markdown merchandise and may not be used in combination with any other discount or coupon. The Getty Center presents European paintings, sculpture, French antique furniture, decorative arts, illuminated manuscripts and international photography displayed against a backdrop of dramatic architecture, tranquil gardens, and breathtaking views. Completed in 1997, the Getty Center has become L.A's most visited cultural attraction. The museum offers a fine-dining restaurant, and casual cafe. Entrance is free. Show your Badge at the Getty Villa, it gets you $5 off parking, and a 10% discount in the Getty Store. Museum admission is always free; a reserved ticket is required. The Getty Villa is an educational center and museum dedicated to the study of the arts and cultures of ancient Greece, Rome and Etruria. The 10% Getty Store discount does not apply to sale or markdown merchandise, and may not be used in combination with any other discount or coupon. Receive 10% off when you show your badge. Receive a COMPLIMENTARY CHEF’S CHOICE HAPPY HOUR ITEM with the purchase of a happy hour beverage. No cash value. Not to be combined with any other offer or promotion. May be redeemed once per evening per household. Limit three happy hour items per table. Excludes tax and gratuity. Valid for dine-in only, Monday-Friday from 2:30-6PM. Available to parties of 6 or less. Must present offer to server upon being seated. Free cup of tea and additional 10% in store. Free dessert upon purchase of entrée. Show your badge and choose from any of these options: $5 beer flights of any house beers, $5 pints of any house beers, pricing for all Happy Hour food menu items will be applicable at any time. 15% discount for convention attendees. Cannot be combined with promotional menus such as happy hour or dineL.A. menus. Receive a COMPLIMENTARY FRENCH ONION SOUP with the purchase of a lunch entree. No cash value. Not to be combined with any other offer or promotion. May be redeemed once per evening per household. Excludes tax and gratuity. Valid for dine-in only during lunch. Available to parties of 6 or less. Must present offer to server upon being seated. 10% off entire check for either Dine-in or Take-out. 10% off with the show your badge program. Does not include happy hour, alcohol, or catering. Not valid with any other offers. Expiration date 12/31/18. Receive TWO COMPLIMENTARY SIDES with the purchase of two lunch entrées when you show your convention badge. No cash value. Not to be combined with any other offer or promotion. May be redeemed once per evening per household. Excludes tax and gratuity. Valid for dine-in only. Available to parties of 6 or less. Must present offer to server upon being seated. Receive a complementary dessert of your choice with the purchase of lunch from NM Cafe at Neiman Marcus Topanga. Receive 10% off food and beverage. Not valid on holidays or contracted events. No cash value. Not to be combined with any other offer or promotion. Excludes tax and gratuity. Valid for dine-in only. Available to parties of 8 or less. Must present offer to server upon being seated. Offer expires 12/31/18. Receive a free cookie when you show your badge. Receive 15% off food and beverage. Not valid on holidays or contracted events. No cash value. Not to be combined with any other offer or promotion. Excludes tax and gratuity. Available to parties of 8 or less. Show your badge to your server to redeem this offer. Enjoy a complimentary Oak Grilled Artichoke or Calamari Appetizer (with purchase of entrée). Show your badge and receive 15% off. Can't be combined with any offer or discount. Not valid during major sporting or special events. Receive 20% off food. Rusty's will reopen June 1st, 2018 after a major expansion and remodel. Not valid with other discounts, offers or private events. Complimentary glass of wine from our Maddalena brand, or non-alcoholic beverage, with purchase of entrée at Maddalena restaurant in San Antonio Winery. 50% of Bottles of Wine and/or Sake! Limit 2 per group; valid for groups of 14 or less; not applicable for corkage fees. 10% off when you show your badge! 10% discount off the check, excluding Happy Hour & Daily Specials at the bar or any other offer/promotion. 10% discount on food and beverage at Ziran Restaurant located inside The LA Grand Hotel Downtown. Discount does not apply to alcohol or “Happy Hour” Prices. Discount cannot be combined with any other offers, discounts or specials. Tax & gratuity excluded. Receive 20% off when you show your badge. Receive a 15% off savings certificate when you show your badge at the b Helpful Desk in Bloomingdale's Century City, Beverly Center, or Santa Monica. See certificate in-store for details and restrictions. 20% discount on in-store services Monday-Thursday only at Blushington Topanga. Excludes the Peel Bar and lash extensions. Valid in-store only. Not valid with any other promotions. Discount not available on black out dates. Show Your Badge and get 5% off when purchasing beauty and food items at DFS LAX stores, Terminal 2 to Terminal 7 and Tom Bradley International Terminal. Restrictions apply. See store for details. Offer expires 12/31/18. 20% off all time pieces and 25% off all gideons jewelry designs. Receive 30% off one full-priced style when you show your badge. Receive 15% off full-priced items when you show your badge. 20% discount on any designers' sunglasses or eyeglasses and prescriptions lenses. Show your convention badge at any Los Angeles area Macy's along with promotion code FW53N2 to receive a 15% convention discount one week before, during, or one week after your convention or meeting. This discount offer is subject to some brand and product category exclusions, so be sure to ask a sales associate about which items are applicable before you make a purchase. At our Downtown LA (The Bloc), Century City, and Beverly Center Macy's, we also offer 15-minute, complimentary beauty service to freshen up your day. Simply show your badge in the beauty department within the time frame above at any of those three locations. Complimentary MyStylist personal shopper, subject to appointment and availability. Private fitting rooms for groups of 5-10 including an optional, personal shopping trends presentation, subject to appointment and availability. For appointments, please contact our DTLA Visitor Center at .+1 213 628 9311 x2740 or simply stop there on the 2nd floor of our DTLA store. 20% off your purchase of $100 or more on select styles. Cannot be combined with other offers or promotions. Certain restrictions may apply. See associate for details. Valid through 12/31/18. Save 10% off our Luxury Sedans, SUVs and Sprinter Rates. Earn points and cash rewards whenever you take Uber. Score your first ride FREE with promo code DISCOVERLA. Redeem immediately, worth up to $25. Single use only. Ride to any destination. Terms and restrictions apply. Show Your Badge and receive $8 off per person, on round-trip Airport Transfers. Mention Promo code: "LACVBWEB" to receive your discount. Servicing LAX, SNA/OC and LGB Airports. Reservations are required. Please click on the shuttle link or call Karmel Shuttle Toll free at 1-888-995-(RIDE) 7433.